To “Migrate WordPress.com to WordPress.org” is not a difficult job, all you need to understand the whole processor before you start. 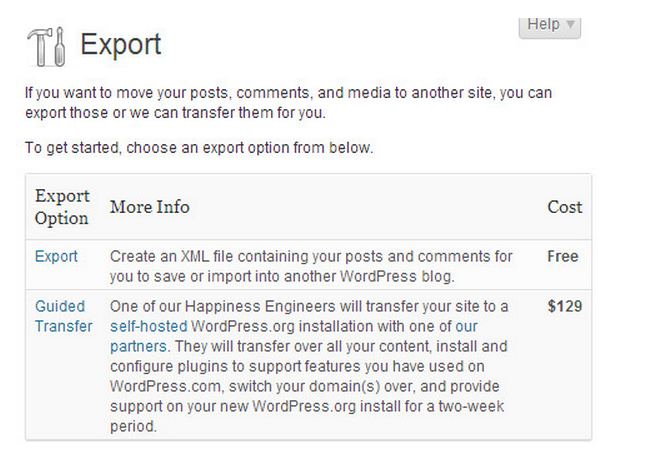 Today I am going to make a tutorial on “How to properly move your data from WorPress.com to WordPress.org. I am assuming that, you are familiar about the difference between the WordPress.com vsWordPress.org. If you had started your journey from free hosted WordPress.com, and now you become serious about blogging and want to make a self hosted blog, then you are at the right place. This tutorial will definitely help your to migrate from free hosted wordpress.com to self-hosted WordPress.org. (Note) I am assuming that you have purchased a self hosted domain name. If you haven’t purchased a domain yet, but want to transfer your blog to self-hosted website, we highly recommend you to purchase a domain from Bluehost, they will give you a free domain + 50% discounted hosting. WordPress is also officially recommending Bluehost for your blog. 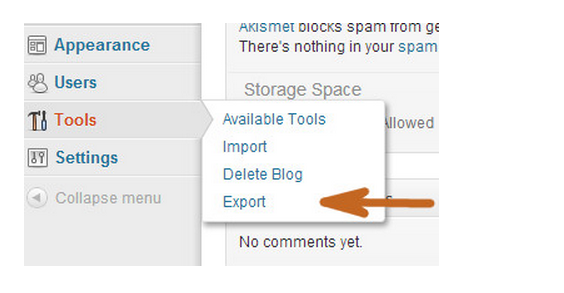 Just log-in to your WordPress.com site, on the Dashboard you will find the Tools Icon, click on Tools and then on export. It will lead to export portion. 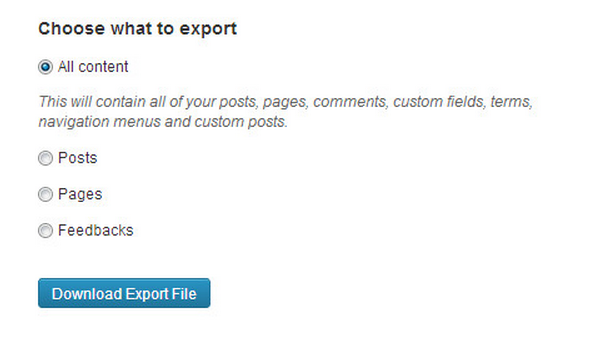 Step 2: Choose the free export option. Once you choose the free option, the next screen will be appearing, here you will be asked to “Choose what to export”. I think you want to all of your posts, images, pages, comments, custom fields, tags, categories, navigation menu and all content information, then all you need to choose “All Content” and press the “Download Export File”. (Note) The downloaded files are in XML format as below, don’t worry about it. Just log-in to your new self-hosted site and here again go to Imports button blew the Tools. 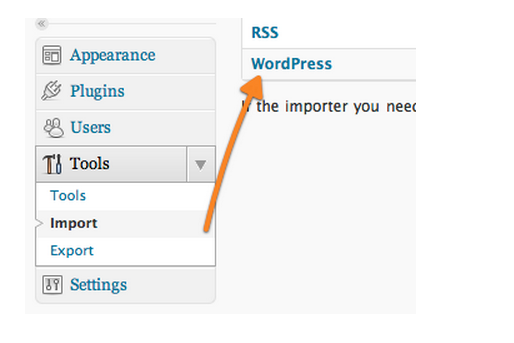 Click on WordPress, here you will be asked to install a WordPress Importer Plugin. Just install and activate it. Once it will install, you will find the below screen. Upload that XML file, which you have downloaded before from free hosted WordPress.com site. (Note) If your XML file size is larger than 2MB, normally it is not larger than 2MB, because the data is normally in KBs. If you got this problem then you got 2 options. First you should Split your file with the help of WXR File Splitter, or you can ask your web-hosting company to increase the limit temporarily. While importing the data to new self-hosted site, you will have the option of assigning a user, or importing your old attachments, which include images, files etc. If you had royal followers in wordpress.com, all you need to redirect those followers to your new self-hosted site. Go to the WordPress.com the free hosted site not the self-hosted one, go to Settings then click on Reading and choose the option of “I would like my blog to be private, visibility only to users I choose”. Finally you should keep all “Search Engine Juice” through which you can redirect your old users to your new self-hosted blog. How to Redirect Old Visitors and Preserving SEO? You have moved your data to self-hosted site, but worried about your Royal Audience and SEO reputation. Don’t worry about it, because WordPress.com gives you a “Redirect Option” on his site. You will face a little problem here, because it’s not free, you have to pay US $13 per year. If you got a huge audience on WordPress.com, $13 is not a big deal to redirect those to self-hosted site. The upgrade will provide redirects and allows search engine to be automatically redirected to your new self-hosted site. How long should I keep paying for this Redirect Feature? It depends on your audience, because if you had 1000+ followers, better to pay for 1 year, secondly as long as your old users to memorize your new self-hosted domain name. What happen to my old Subscribers? WordPress allows you to move your royal subscribers to self-hosted site, all you need to install “Jetpack Plugin”. This plugin will add your subscribers to your new site. Once it will install, you need to “Contact the WordPress.com team” and leave a request to migrate your subscribers to your new site, like example.com. How much cost will occur while switching to wordpress.org? There are no charges for moving content from WordPress.com to WordPress.org. However, there are only web hosting costs. What If my images are break? Normally all attached images are downloaded in XML files, but in-case these have been not downloaded or break during the import/export process. Don’t worry about it, because “ImportExternal Images Plugin” will take care of that. Why I have to migrate from WordPress.com to Wordpress.Org? Because WordPress.com is a free hosted website, where you cannot generate money easily, as we can generate money in WordPress.Org, which is self-hosted and you can create your blog according to your choice and can be able to install Plugins and Ads. I hope it helped you out; still you got any problem or any question, please leave a comment below.